4 Seed Money Facility The seed money project should result into a concrete plan for the main project. 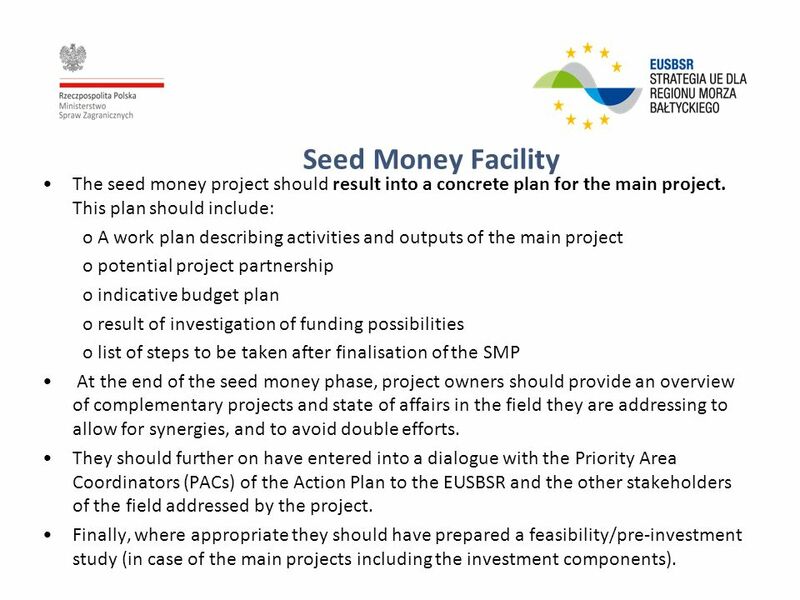 This plan should include: o A work plan describing activities and outputs of the main project o potential project partnership o indicative budget plan o result of investigation of funding possibilities o list of steps to be taken after finalisation of the SMP At the end of the seed money phase, project owners should provide an overview of complementary projects and state of affairs in the field they are addressing to allow for synergies, and to avoid double efforts. They should further on have entered into a dialogue with the Priority Area Coordinators (PACs) of the Action Plan to the EUSBSR and the other stakeholders of the field addressed by the project. Finally, where appropriate they should have prepared a feasibility/pre-investment study (in case of the main projects including the investment components). 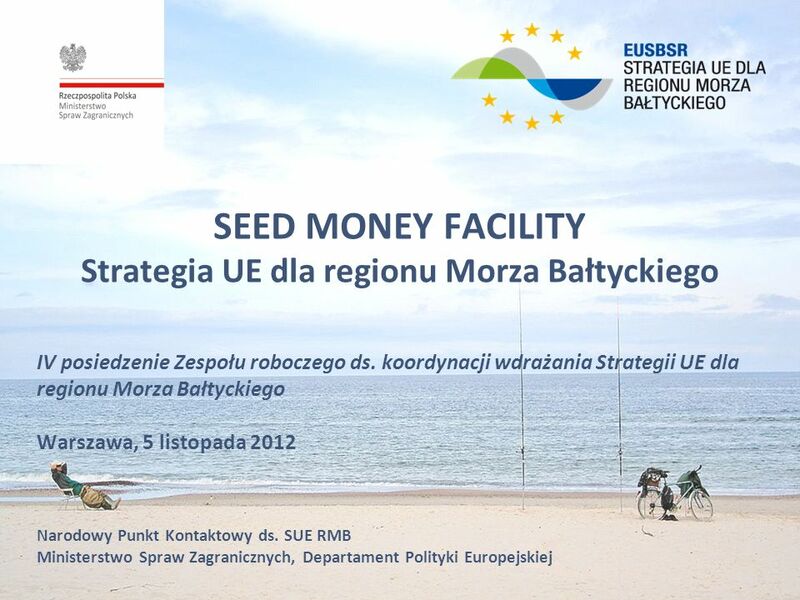 5 Seed Money Facility Application and assessment Call for proposals: We propose a permanent open call (continuous submission and assessment of the applications) Application form: simplified application form (based on the Baltic Sea Region Programme project idea form (PIF) and the template for the cluster initiatives) + letters of support from the respective PAC. 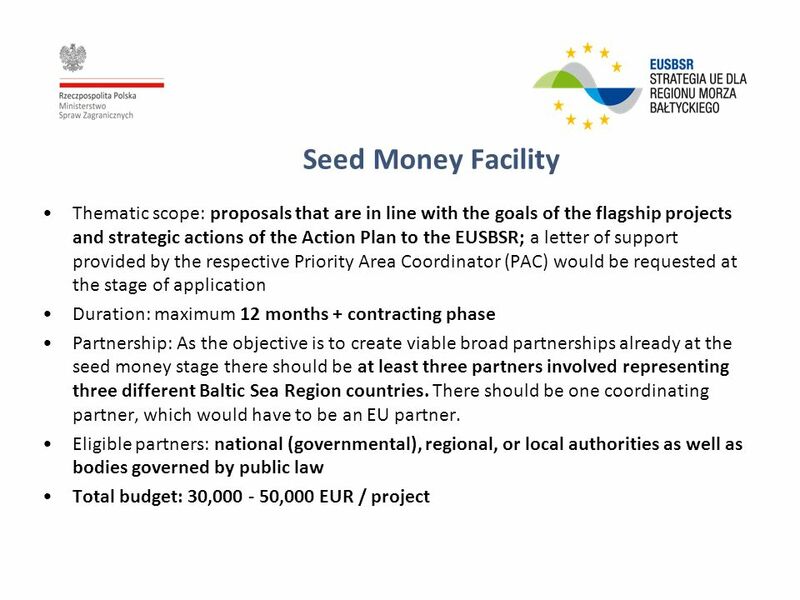 Operational assessment criteria: o Relevance of the proposal in relation to the Action Plan of the EUSBSR, o Transnational partnership with clearly allocated roles, o Seed money project work plan leading to outputs that are in line with the Seed Money Facility requirements, o Cost-efficient budget plan. 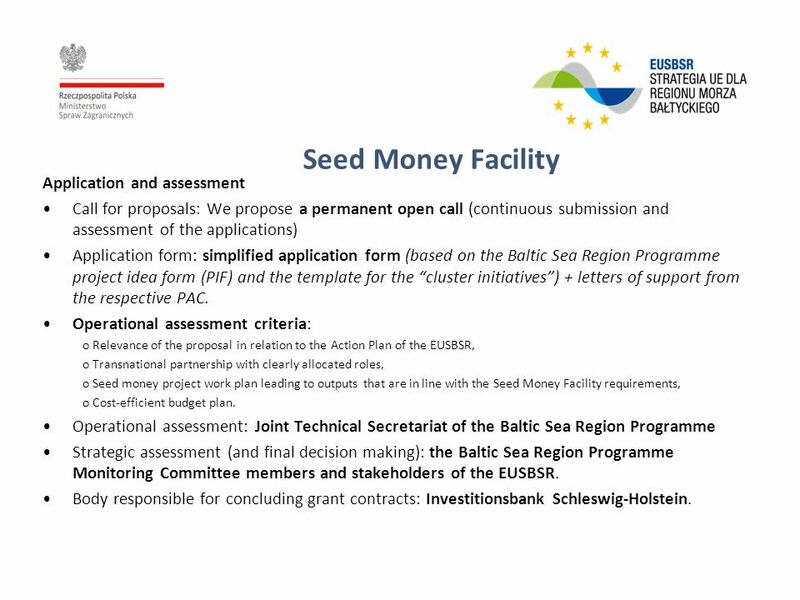 Operational assessment: Joint Technical Secretariat of the Baltic Sea Region Programme Strategic assessment (and final decision making): the Baltic Sea Region Programme Monitoring Committee members and stakeholders of the EUSBSR. Body responsible for concluding grant contracts: Investitionsbank Schleswig-Holstein. 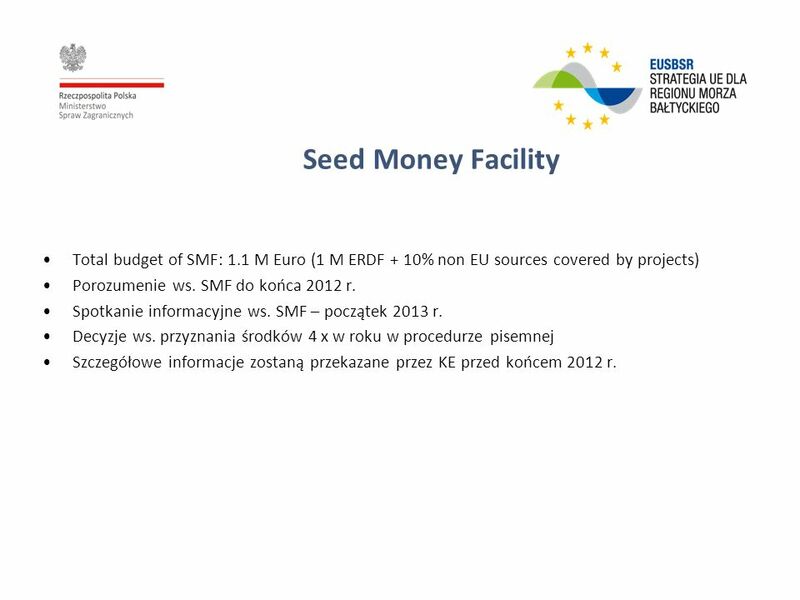 6 Seed Money Facility Total budget of SMF: 1.1 M Euro (1 M ERDF + 10% non EU sources covered by projects) Porozumenie ws. SMF do końca 2012 r. Spotkanie informacyjne ws. SMF – początek 2013 r. Decyzje ws. 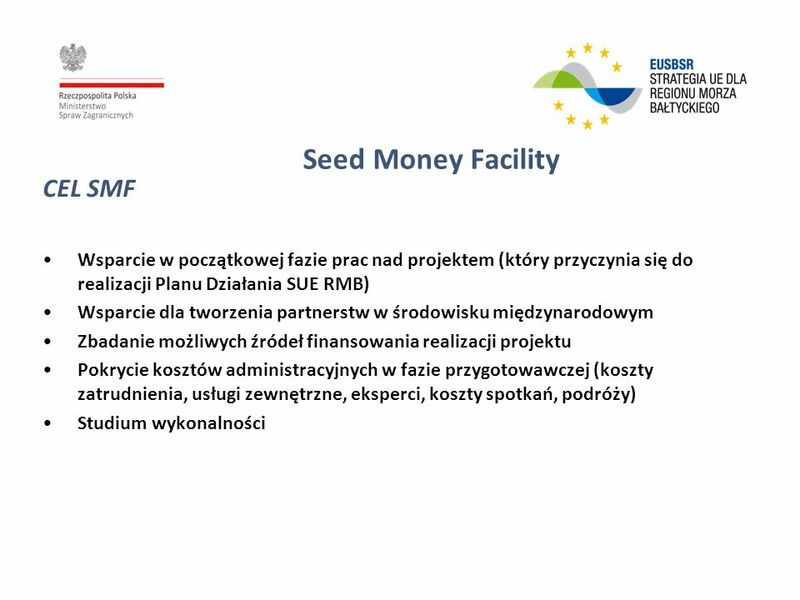 przyznania środków 4 x w roku w procedurze pisemnej Szczegółowe informacje zostaną przekazane przez KE przed końcem 2012 r.
Pobierz ppt "SEED MONEY FACILITY Strategia UE dla regionu Morza Bałtyckiego IV posiedzenie Zespołu roboczego ds. koordynacji wdrażania Strategii UE dla regionu Morza." Gdansk Urban Communication Project - Stage III Gdański Projekt Komunikacji Miejskiej – etap III. Ocena indywidualna projektów – kryteria i zasady oceny projektów (działalności wspomagającej) PASR pierwszej edycji Bruksela 5-10 lipca 2004 Ocena indywidualna.